Yesterday, my husband and I had my mom over for a late afternoon lunch. Considering that this is day 5 of my raw diet, I decided that I would make a protein-packed mixed green salad with a few surprises. These wraps are so delicious and nutritious! They are a great alternative to flour or corn tortillas and, in my opinion, they travel much better. I have taken collard wraps on car trips and to various outings and they always hold up nicely. To make collard wraps, take one collard leaf and remove its stem to form two halves. Each leaf will make 2 collard wraps. Lie each leaf flat and spread a heaping teaspoonful of cashew and walnut pate along the bottom of the leaf. Add long strips of sliced cucumber and green onions. 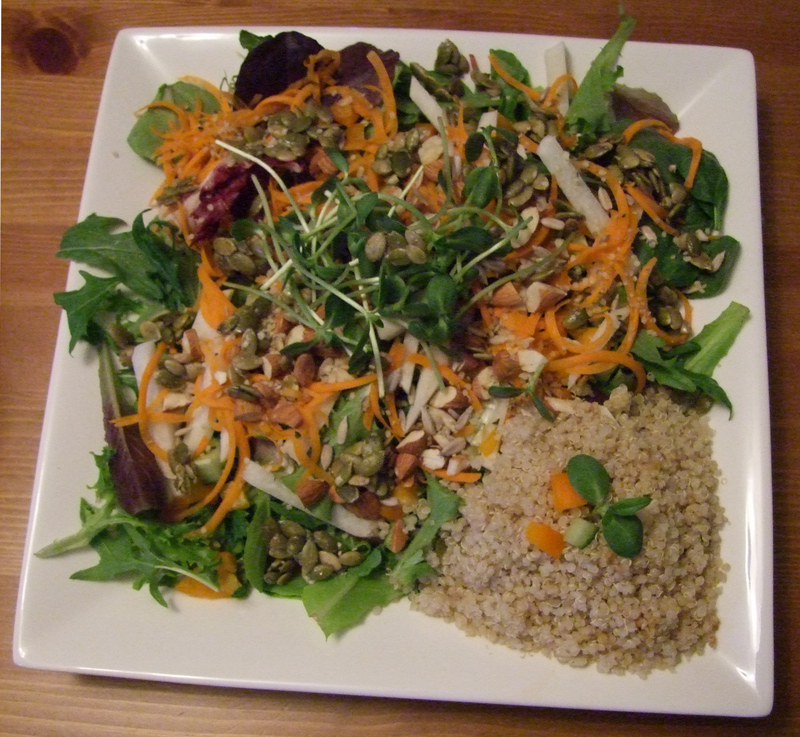 I added some grated carrot and sunflower sprouts, as well. 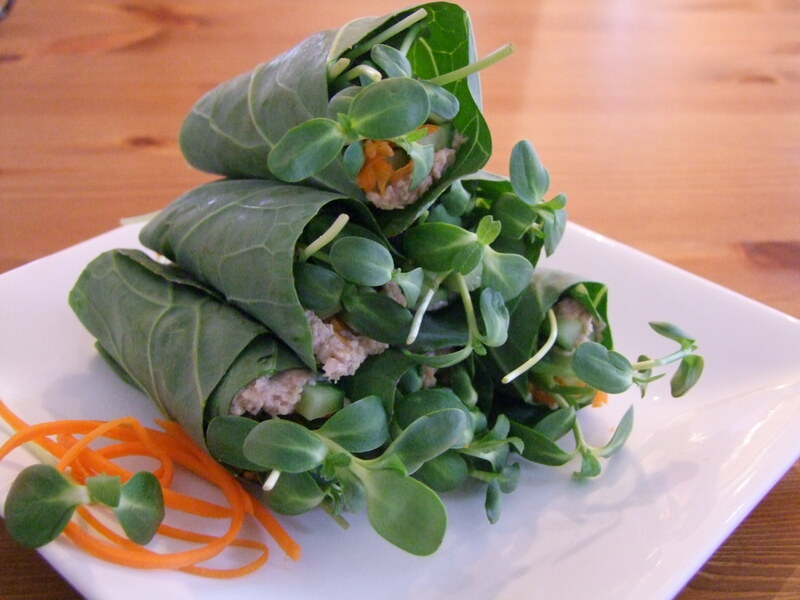 Roll each leaf up lengthwise and place on it on a serving dish. Place celery, vinegar, garlic, miso, and nori in a food processor and pulse a few times until you have small pieces. Add ground cashews and walnuts and mix. 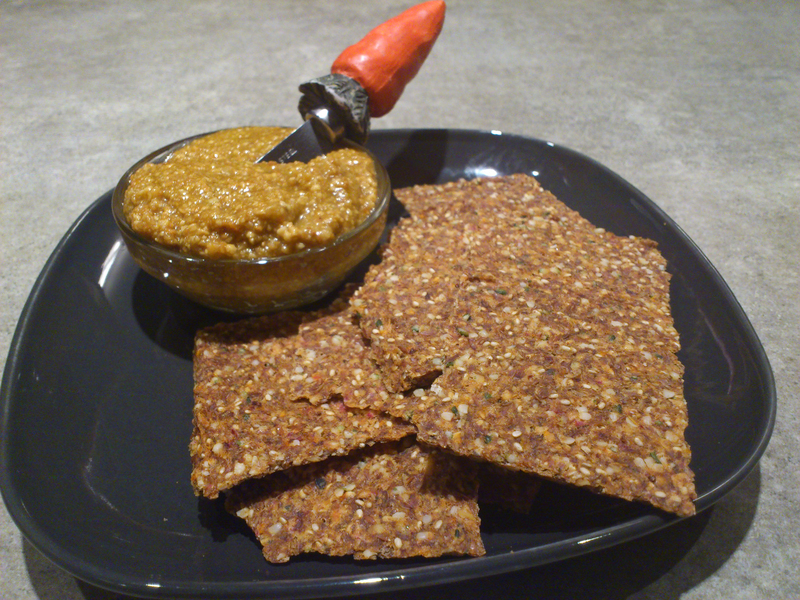 I found this recipe in “RAW FOOD, Real World” by Mathew Kenney and Sarma Melngailis. These “can’t-stop-eating-snacks” were made in my dehydrator* (112 degrees Fahrenheit/44 degrees Celsius for about half a day). If you own a deydrator, I would encourage you to use it, but, if you don’t, you can put them in your oven at 325 degrees Fahrenheit/163 degrees Celsius for about 10-15 minutes. Toss the ingredients in a bowl and spread on a dehydrator tray or a lightly greased cookie sheet. * Dehydrating food at low temperatures allows the food to maintain its live enzymes, nutrients and vitamins. 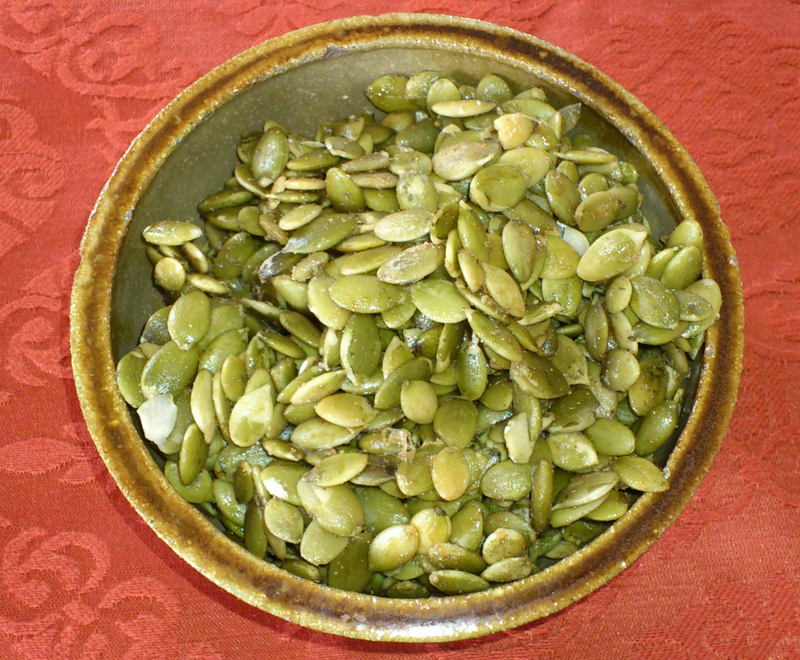 Did you know that raw pumpkin seeds are packed with protein (100 grams of seeds provide 30 grams of protein!)? I didn’t make this kombucha. 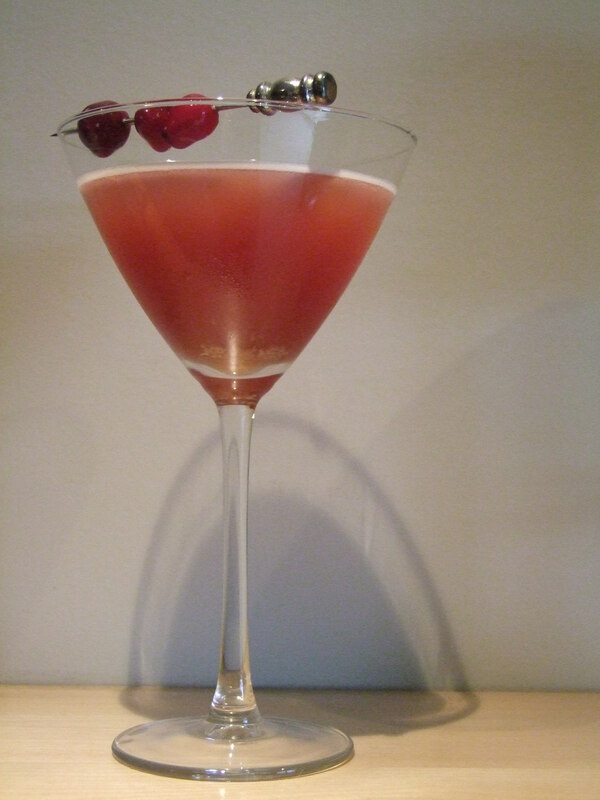 This is Synergy’s Gingerberry with a cocktail pick of organic cranberries. Kombucha is a fermented, sweetened tea full of probiotics. I have been addicted since my first sip. When I was a kid, I loved to go out for dinner with my family to restaurants that had a salad bar. I just loved the idea of choosing my own ingredients and mixing my favourite veggies together to make a satisfying and delicious meal. Today, late night dinners in our house often consist of a salad bar. When it’s just too late to start cooking and “take out” is not an option, this salad is IT! I like to spread out the ingredients in small bowls on my kitchen counter and hand each member a dinner plate to go to it. Kids love it because they get to choose the gems for their greens, not mom. This was my salad this afternoon. It looks busy, but it was awesome! I started with a big handful of organic, mixed greens. I then tossed in a variety of chopped vegetables (peppers, cucumber, and green onions – that was what was available in my fridge on this day) and some jicama sticks. My fridge also had in store a wonderful variety of nuts and seeds (raw sunflower seeds, hemp seeds, and almonds) and I tossed them in the dish, too. For my mom and husband, I finished it all off with some maple, candied pumpkin seeds and my homemade salad dressing. Stir with a fork and pour over salad mix. Enjoy! I hope this post inspires you to make your own collard wraps and salad bar lunch! Be creative. If you have some mixed greens and veggies in your fridge, why not throw a salad together. Simple. Easy. Fast. Delicious. Uber-Nutritious. Gotta love that! *** A BIG THANK YOU to my mother, Valerie Dale, for coming to lunch with her camera. My mom took photos of our collard wraps, salad, and kombucha! This entry was posted in Appetizers, Uncategorized and tagged appetizers, collards, food, gluten-free, jicama, pate, pumpkin seeds, raw, recipes, salad, vegan on October 20, 2012 by uberdish.